Recycling Revolution has a competitive and reliable waste solution whatever type of business you are. From 140 litres to 1100 litre bins, we can do anything the big businesses can do but in a different way. We collect cardboard, paper, glass, plastic bottles, cans and batteries.We can handle your general waste too with the help of our local partner Quay. 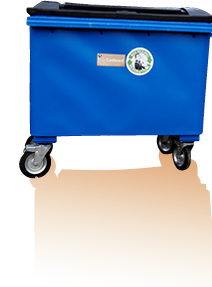 We are flexible enough to offer smaller bins than anyone else, which helps out the smaller business. But of course we can do the big stuff too. Why is Recycling Revolution different? We are a Social Enterprise using our business to make a difference to people in our city who need extra help in the work place, be they long-term unemployed or suffering from learning difficulties. Our company structure allows us to donate any profits to charity. We even take suggestions from our customers on who to contribute to. We only ask that they are local or environmental. We do not co-mingle waste. Paper and card that is mixed with glass and plastics will become contaminated to the point where 30% of the waste is lost to landfill. For the best results and resale value we collect our paper and card separately. The purer the waste, the greater the benefit to our environment and our community. Visit the Campaign for Real Recycling for more information. 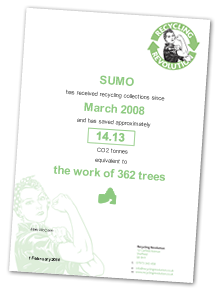 We have used Recycling Revolutions services almost since we opened our doors in August 2008. As people can bring their own wine to Otto's, we generate a lot of glass waste. Their service is efficient, reliable and very good value. I can't really ask for more. Mark and his team just allow me to get on with managing other aspects of my business. The way it should be. Recycling Revolution is registered with the Environment Agency Supported by Heeley Development Trust and KeyFund.We are members and supporters of ‘Livng Wage�? © Recycling Revolution.All rights reserved.